If you are familiar with the fibreworkshop instagram feed you will have spotted that I’ve been doing quite a bit of messing about with colour this summer. 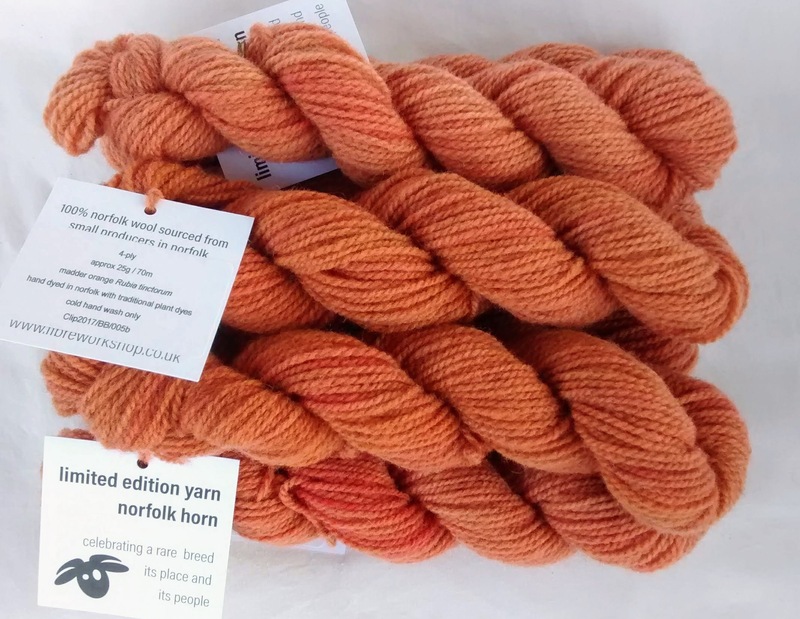 In particular natural dyes and the colours of the plants that grow abundantly in Beckland – this is the historic stomping ground of the Norfolk Horn after all. 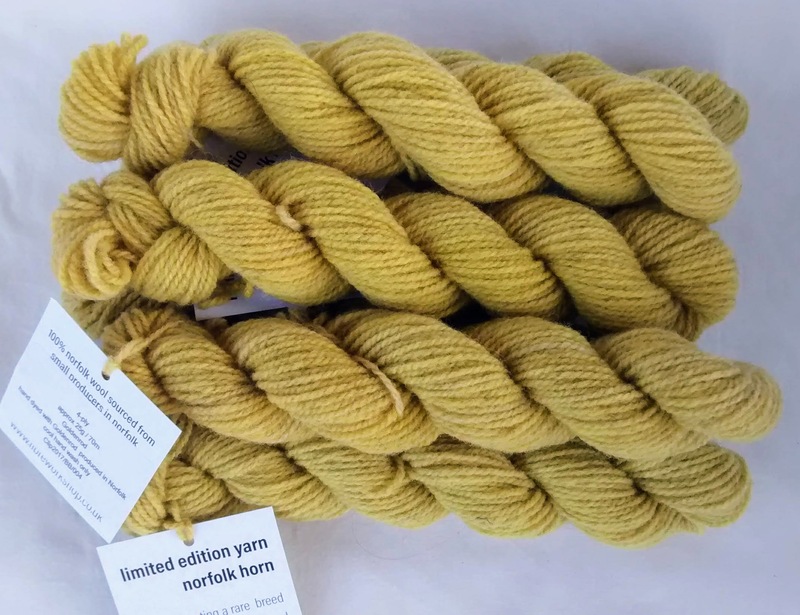 Norfolk horn yarn has a lovely creamy milk colour that is infused with subtle flecks of darker fibres like really good vanilla ice cream. At first I couldn’t bring myself to dye it but…well never say never. I wanted to keep that special Norfolkishness. Early experiments with my usual acid dyes were disappointing, too uniform too harsh too cold. The Norfolk sort of got lost. 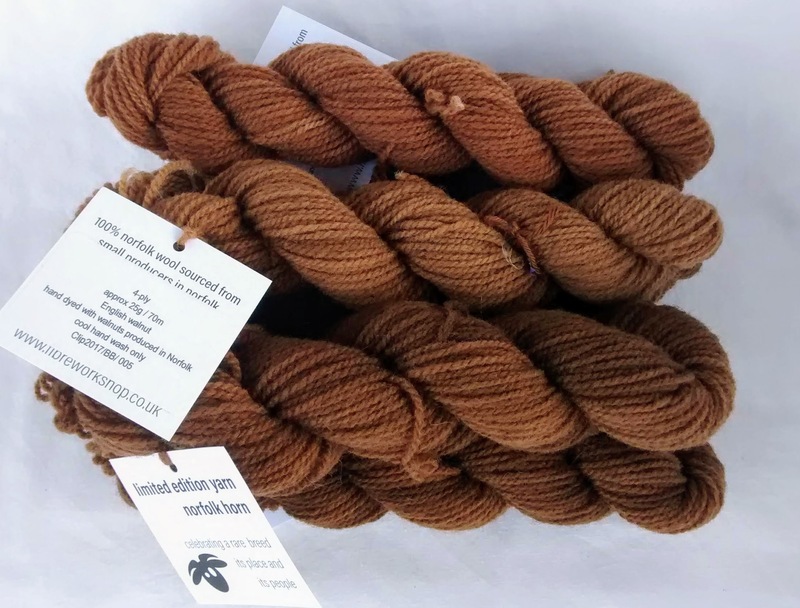 It just had to be natural dyes from plants that have a tradition here abouts. I will write about my summer of dye school later on when I get time. First it had to be woad, glorious beautiful wonderful magical woad. 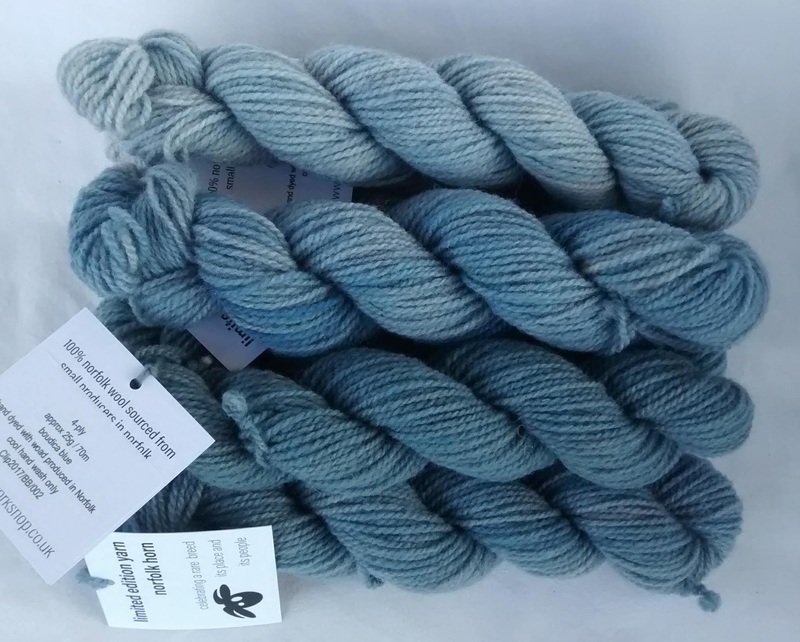 I’m lucky to have the Woad centre at Beetley, just up the road from Gressenhall (incidentally where much of the fleece that went into the 2018 yarn came from). Sadly the centre is now closed and Woad production has ceased. Ian Howard was a mine of information and helped me with the science of woad, providing pigment to start me off and some seed to begin cultivating my own. I’m now self sufficient – although getting some weird looks and comments at the allotment but I’m used to that…Blues from the colour of Boudicas body painted warriors to pale icy baby blues. Then came the yellows. An odd absence of Weld in the countryside lead me to use Golden Rod, the next best thing, until the crop at the allotment was ready. I’m taking my first harvest and its drying at the moment. Yellows and golds gorgeous! And the final in the classic triptych Madder. If you have ever been to Norwich you will have been through Madder Market, named for the medieval market where the Madder was traded. Rich rusted reds, pumpkin and tangerine oranges. Like flaming autumn leaves. And finally I wanted a good neutral that would balance with the norfolkishness. this came in the form of a crop of walnuts traded with some of our hops with my friend Jane. Gorgeous warm and dark chocolatey brown. I also wanted a colour palette that was vibrant, colourful, modern and warm. I think I’ve acheived this. They make me so happy! 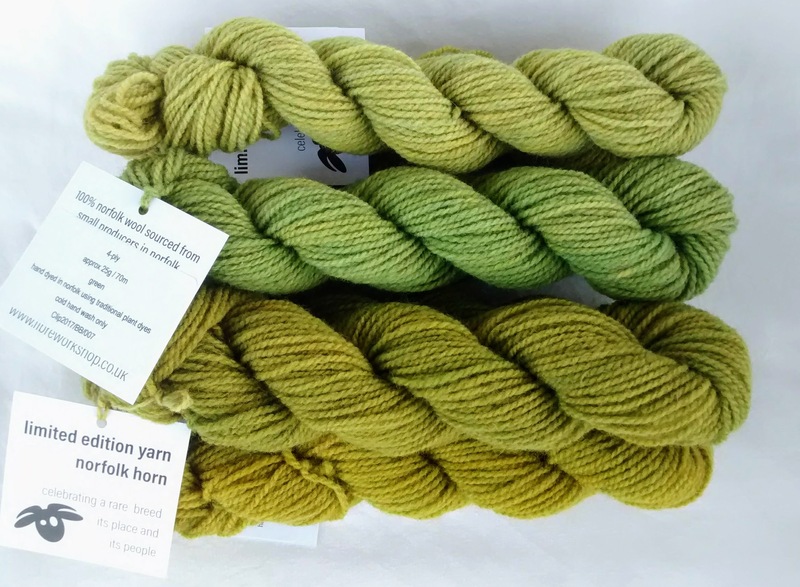 Skeins are 25g approx 70m and are £5.00 per skein. Postage is UK £3.40 (royal mail 2nd class – I will ship signed for UK £4.40 specify if you prefer this option). I will ship globally but will quote shipping cost when you order. At the moment payment is via PayPal or bank transfer. 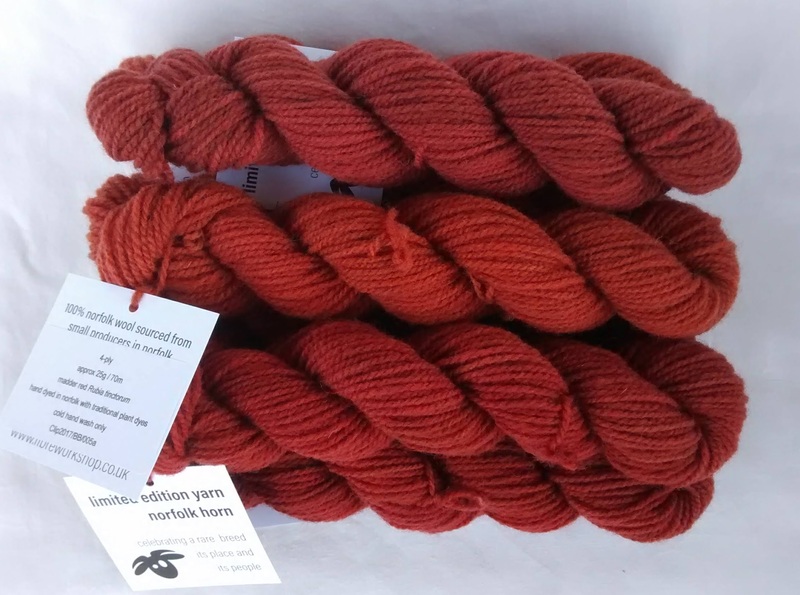 To place an order please email me: jenn@fibreworkshop.co.uk with how many skeins you would like and we can take it from there.